In September 2015, an at the time undescribed, autotrophic taxon was discovered in the western English Channel (station L4) and also in the eastern English Channel and Celtic Sea during the Polarstern Cruise PS95 a month later. Subsequent investigations revealed further extensive records (going back to 1992) at stations in the English Channel and the southern North Sea (e.g. Helgoland Roads and Sylt Roads time series stations). Stations in the Northern North Sea have not recorded this distinct taxon. With the available records and crucially, the accompanying image metadata, we are able to chart a clear distribution record with occurrences being restricted to the southern North Sea and English Channel. The biological data shown are from Lugol-fixed Utermöhl counts and investigations of live and Formalin-fixed net hauls (20 μm mesh size). All image material shown is available in the online repository Planktonnet (http://planktonnet.awi.de). We report the distribution, based on geo-referenced image records of an easily recognisable, yet taxonomically uncertain, autotrophic organism. Distribution patterns of the unidentified autotrophic taxon suggests entry of this taxon into/out of the North Sea via the English Channel. Further investigations providing image-documented information over several years is clearly necessary to clarify its dynamics and ecological characteristics. 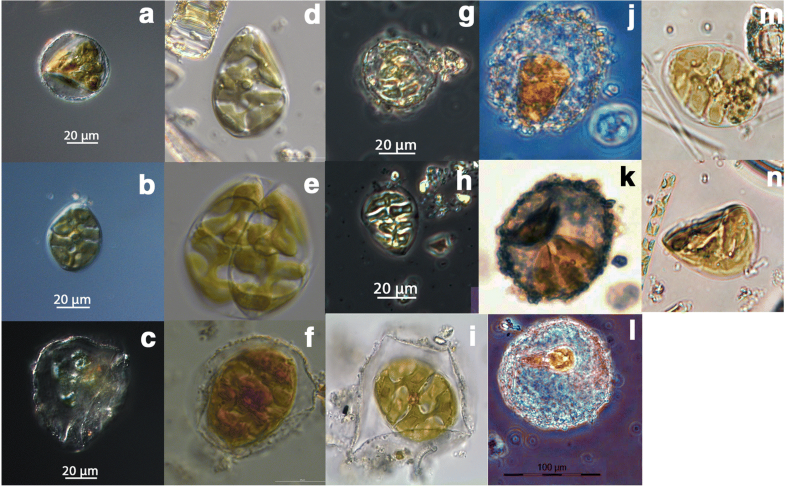 Regular phytoplankton monitoring stations in the North Sea and English Channel possess detailed records of the taxa that have been observed there for at least 20 years (Hoppenrath 2004; Widdicombe et al. 2010). These include the Western Channel Observatory‘s stations L4 and E1, stations along the Dutch coast, the Biologische Anstalt Helgoland with its Helgoland Roads long-term phytoplankton time series (located in the German Bight (Wiltshire et al. 2010)) as well as the Wadden Sea station Sylt. Collectively, these time series stations are ideally placed to chart differences in the dynamics and distribution of phytoplankton diversity in the English Channel and North Sea. However, while the taxon lists generated during routine regular observations are extensive, they often comprise a large number of unidentified taxonomic units which are only recorded as size classes or verbatim taxa without assigning an accepted species name to the taxon (as an example the Helgoland Roads taxon list comprises 356 taxa and 250 distinct species). The comparability of the unidentified taxa between different time series stations is usually very limited, especially size classes e.g. unidentified Gymnodiniaceae, can also comprise different species at different times of the year. Increasingly this situation is remedied however by the fact that analysts produce detailed photographic documentation of the taxa (both unidentified and known tax) that are routinely recorded or appear at a site for the first time. Here we report a first distribution record, collated from multiple time series stations and cruises of an organism for which the taxonomic identity is still under discussion but that can be identified reliably on the basis of its morphological characteristics based on photographic material available in a number of research stations. This organism (referred to as the ‘pringle’) is morphologically distinct, with an undulating parabeloid movement that appears to be typical for this organism. It can be identified reliably and data for this taxon can be analysed jointly between different data sets. Here we review all available data for this taxon to make a first attempt at characterizing it ecologically. For this study, records from a large number of ship records and time series stations were collated from live and preserved samples. For counts in the context of routine monitoring programmes, Lugol’s-fixed sample counts are used by each time series represented here. Additional records were obtained from net hauls (20 μm mesh size) and analysed live (L4 and E1, Sylt Roads) or fixed in hexamine-buffered Formalin (Helgoland Roads). Pre-requisite for being included in the study was that at least some records were annotated photographically, as there is no consistently assigned taxonomic name for this taxon yet. Image material obtained for this study was from both Lugol’s-fixed and live material: The characteristics of this distinctive taxon as described below, meant that this diverse material was still usable for documenting the presence of this taxon. All photographic material was taken at a magnification of × 200 and different camera set ups including e.g. Zeiss Axiocam Hrc (Helgoland Roads) and a Leica DFC-450C and Olympus DP25 at L4 and E1). All material used for this study has been archived online in the planktonnet database (http://planktonnet.awi.de//index.php?thematicid=2086). The map of species distribution spread was generated using QGIS 3 (QGIS Development Team 2018, https://qgis.org/en/site/). The earliest record documented by image material was from a cruise in the English Channel in 1992, where live material was taken by the Dutch monitoring agency within the framework of research on Harmful algal blooms (HAB) (Rademaker and Koeman 1992). The cells were provisionally identified as Campylodiscus, and their typical movement was noted. In 2001, the taxon was spotted again on the monitoring stations along the Dutch coast, and since then, routinely monitored within the Dutch monitoring network (Veen et al. 2015). In the following years particularly after 2012 this unclassified taxon has been reported by a number of time series stations in the English Channel, southern North Sea and the Dutch Wadden Sea. In September 2015 it was observed at Station L4 in the western English Channel as well as on Polarstern Cruise PS95 (in October and November 2015) at station PS095–001 in the eastern English Channel and PS95–002 in the Celtic Sea. The latter was the only record outside the North Sea or English Channel. (Fig. 1, Table 1). In July 2016 it was also detected at a site near the mouth of the River Elbe (Station Elbe 6 of the Helgoland transect surveys). Further records have since been confirmed from Helgoland Roads and other coastal stations in the German Bight (data for 2017 and 2018 not shown). Earlier anecdotal reports also exist for Helgoland and the Waddensea Station Sylt in northern Germany. However, as these were not documented in sufficient detail (e.g. with image material) they have not been included in the present communication. To our knowledge, this distinctive taxon has not yet been found in the Northern North Sea (e.g. the Scottish Coastal Observatory), Central North Sea or the Baltic (E. Bresnan and M. Johansen pers. comm). Cells appear variable in symmetry (depending on the orientation of the cell) from oval to wedge-shaped or undulating. They are also clearly pigmented. The nucleus is round and located centrally within the cell. Cells contain several large plate-like chloroplasts, often showing typical squarish inclusion bodies. Cells are motile, with undulating movements and rotation along their long axis. Movement is slow and a flagellum has not been observed. Single or paired cells can occur ‘naked‘ or within what appears to be a mucous envelope. The enveloped stage is also motile, moving inside the mucous envelopes. Particularly the enveloped forms can easily be discerned from photographs and in different fixation methods (compare for instance Fig. 2a (live) and g or h which are Lugol’s fixed). The identity of the organism requires clarification. Although clearly motile, flagella have never been observed in cells of any of our samples and the taxon has therefore been referred to as a diatom. Cleaned specimen seem to confirm this view. A genus with a similar paraboloid symmetry is Campylodiscus, but this organism is generally much more heavily ornamented and most species are much larger than the taxon investigated here. Moreover, Campylodiscus is also often considered as a freshwater species (although it can also be found in coastal waters). Upon recording this species for the first time in samples from Dutch monitoring stations in the Southern North Sea, Lugol’s-preserved cells were critically examined using oil immersion microscopy. Fine striation was observed on the surface of the cell, and a central nodule with reinforced structures appearing to be striae is just discernible along the raphe (Fig. 3). Based on those characteristics, and due to the likeness to the drawing in Tomas (1997), this entity was therefore recorded as Membraneis challengeri (Grunow) Paddock in the Dutch data. The taxon has also been regarded similar to Tropidoneis confusa (=Plagiolemma confusum, (Hendey) Paddock) as described by Hendey, 1964. However, the symmetry of the organism does not fit the description of either the symmetry of the basionym of Membraneis challengeri, Navicula challengeri, which is long and straight, nor the shape of Tropidoneis confusa. Finally, neither formal description mentions motility or the mucous envelopes in which cells are frequently found, both in live and preserved samples. During the submission process a new diatom species (Plagiolemma distortum) has been formally described that appears to fit the morphology of the taxon dealt with here (Nezan et al. 2018) and mentioned the mode of locomotion seen in our ‘unidentified’ organism. This type of locomotion appears to be non-typical for most other diatom species for which, a gliding motion along a substrate is more common. However, some diatoms also rotate during the process of forward motion (Cohn and Weitzell Jr. 1996; Edgar and Pickett-Heaps 1983). The identity of this taxon remains unclear. The entity has characteristics that link it to Membraneis challengeri but the motility, its symmetry and its mucous envelope are not found in descriptions of the above taxon, or any of its relatives within the Plagiotropidaceae such as Ephemera but fit with the newly described Plagiolemma distortum (Nezan et al. 2018). In any case the cells are distinct enough to verify the occurrence of the taxon at a given station as long as good image records are also available so that a reliable distribution record can be assembled. 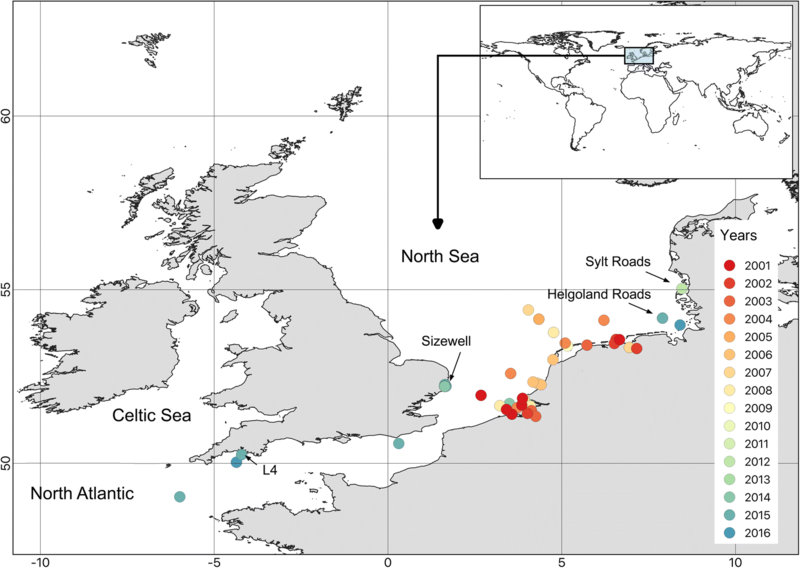 The records collated for this study so far indicate a distribution that is restricted to the Southern North Sea and English Channel (based on 342 records) with occasional records from the Celtic Sea to the west of the English Channel. Through communication within the ICES expert group WGPME it was also confirmed that neither time series in the Baltic or the Coastal Scottish observatory have yet detected this species (M. Johansen, E. Bresnan pers. comm). Considering only the years 2015 and 2016 (the best documented years in terms of the availability of image material) it would be tempting to consider this taxon as an Atlantic species that is advected into the North Sea only occasionally. For benthic neophytes reaching the island of Helgoland the English Channel was also suggested as an important immigration pathway by Franke and Gutow (2004) (see also: (Minchin et al. 2013)). In contrast, the earlier records would indicate a more coastal/brackish preference and therefore different direction of extending its range (see particularly data from the Dutch Delta and Wadden Sea, a site close to the Elbe estuary (Site Elbe 6 in Table 1) and recently also in the harbour of Antwerp. This is also supported by the fact that during the periods of occurrence other benthic or ptychopelagic species (the latter defined as species that have a predominantly benthic mode of life but can appear in the plankton e.g. after extreme weather events) were also often present including Paralia sulcata, Actinocyclus and Odontella species, (data not shown but see Fig. 1d). Assuming that the taxon considered here is indeed Plagiolemma distortum, this would also fit with the observations by Nezan et al. (2018) who considered this taxon as potentially benthic or epilithic. But clearly, more sustained observations with a good spatial coverage, appropriate image metadata and preferentially sequence data, are necessary to reveal in more detail the taxonomic position and ecology of this enigmatic species. The number of actual distributional records is still very small, spread over a number of years and more data are therefore required to confirm the origin and main direction of spread of this taxon from the North Atlantic into the North Sea via the English Channel (or vice versa extended its range from more brackish habitats into the open sea). It is also unclear whether first records were really first records or mark the point where an unidentified cell was first recorded as a distinct taxon in a given time series. Importantly, beginning to chart the progress of this species was possible because of the large number of available high-quality records documented with image material. Adhering to a strict protocol for recording new or unidentified taxa photographically and with appropriate taxonomic and biogeographic meta data is therefore strongly recommended for any time series programme routinely determining phytoplankton abundance (Zingone et al. 2015) both to increase the taxonomic consistency and resolution within time series but also to facilitate more detailed comparisons between data sets. AK was funded by the Alfred Wegener Institute Helmholtz Centre for Polar and Marine Research. CW and PR were funded under the UK’s Natural Environment Research Council (NERC) National Capability programme. We also acknowledge the International Council for the Exploration of the Seas (ICES) for supporting the Working group on Phytoplankton and Microbial Ecology (WGPME). The manuscript was planned and its first version written during the annual WGPME meeting in Reikjavik 2017. We thank Silvia Peters at the Biologische Anstalt Helgoland (AWI), Malte Elbrächter and Hanne Halliger at the Waddenseastation Sylt and all the past and present analysts of the time-series stations referred to in this study. We further thank Dr. Dario Fiorentino of the Helmholtz Institute for Functional Marine Biodiversity (HIFMB) for the production of the distribution map. We also thank two anonymous reviewers for their valuable comments. UK Natural Environment Research Council (NERC) National Capability programme. Image material is published in the open access data base Planktonnet (http://planktonnet.awi.de). The geolocations are already freely available. No other data were used. The manuscript arose from discussions between AK and CW. AK wrote the first draft. All authors contributed image material from their time series station and contributed to the discussion of the identity of the taxon. Final editing was done by AK with contributions from RW, RB and CW. All authors read and approved the final manuscript. All authors have given consent to publishing the MS.
Cohn SA, Weitzell RE Jr. Ecological considerations of diatom motility. I. Characterization of motility and adhesion in four diatom species. J Anim Ecol. 1996;32 https://doi.org/10.1111/j.0022-3646.1996.00928.x. Veen A, Hof CHJ, Kouwets FAC, Berkhout T (2015) Rijkswaterstaat Waterdienst, Informatiehuis Water [Taxa Watermanagement the Netherlands (TWN)] http://ipt.nlbif.nl/ipt/resource?r=checklist-twn, consulted: 14.5.2018. Wiltshire KH, Kraberg A, Bartsch I, Boersma M, Franke HD, Freund J, Gebühr C, Gerdts G, Stockmann K, Wichels A (2010) Helgoland Roads: 45 years of change in the North Sea Estuaries and Coasts https://doi.org/10.1007/s12237-009-9228-y.